Subliminal Marketing - Beyond Normal Perception | Business Article | MBA Skool-Study.Learn.Share. Microsoft is the first thing that pops in your mind when you talk about software and so is Google when you mention search engine. You automatically think of Coke or Pepsi when you need to quench your thirst in the hot sunny days. This is the phenomenal impact of subliminal marketing. It all started in 1957 when James Vicary, a market researcher, conducted an investigation into the power of subliminal marketing over the public. He inserted 2 text based subliminal messages – “Eat Popcorn” and “Drink Coca-Cola” into a movie called Picnic and were flashed on the screen for 3/1000s of 1 second in an interval of every 5 seconds, much too fast for a person to consciously read it. The movie with subliminal text was showed in a particular theatre in New Jersey for over a period of 6 weeks. It resulted into a staggering spike in the sales of Popcorn by 57% and that of Coca Cola by 18.1%. So how does subliminal marketing make you think of products when you are not even seeking them out consciously? Subliminal messages are designed to pass below the normal limits of the human mind’s perception and are not recognizable by the conscious mind. Repeated exposure to such stimulus can affect the subconscious mind and result into growing familiarity with the object of stimulus. Familiarity breeds liking more than contempt. Marketing experts bank on this concept of extraordinary functioning of human mind and manipulate thousands of people into buying particular brands over other varieties of products. Product Placement – Brands pay practically thousands of millions of dollars just to showcase their products in movies and TV ads in order to gain mainstream popularity. So it wasn’t a surprise when the good guy Bumblebee in the movie Transformers gets to be a Chevrolet Camaro while the bad guy Decepticon transforms into Camaro’s market rival – the Ford Mustang (notice you don’t see a Ford or Mustang logo on barricade’s grill). Because of the popularity of the Transformers movie series, General Motors made huge profits as the demand for Camaro hit the roof. Many companies use such aggressive ways of product campaigns through entertainment industry, in order to catch attention of the general population. Subliminal Advertising – It is a way of subtly placing a product or a label in a movie or TV show where it is not a focal point or overly obvious. So the brand Coca Cola gets subtly embedded in the subconscious mind of thousands of viewers when it is subliminally-advertised (not that it needs more advertising! ), in the most popular US reality TV show – The American Idol. And doesn’t Vaio look cool, especially if Bond of Casino Royale uses it? So this is how subliminal advertising works – by linking products with the cool trends of the season or the hot celebrities of the entertainment industry, to tap the desires of the ordinary customers so that they could also know how it feels to be in the league of the famous people who uses the same products as they do. Subliminal Messaging – This is a very subtle art of embedding hidden messages in advertisements, posters, logos, etc., to capture the desires of the customers or to catch their attention. 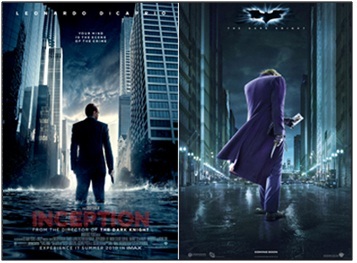 As seen below, in order to impact the sale of the tickets of the movie Inception, Christopher Nolan has done a nice job of branding himself as the director of the Dark Knight by incorporating the graphic effects of the Dark Knight poster into the Inception poster. This had helped in generating the same excitement for the Inception which was there for the Batman series among its fans. Another example of subtle way of cross-marketing is Walt Disney and The Pirates of the Caribbean. Subliminal messaging is not limited to posters; there are many company logos which have hidden messages hinting towards their company’s philosophy. The swoosh in the Amazon logo looks like a smile hinting towards customer satisfaction and it connects the letters ‘a’ and ‘z’, meaning the store has everything from a to z. The arrow between the letter ‘E’ and “X’ in the FedEx logo is an indication of the company’s efficient and quick service. Similarly, the number 31 in the logo of Baskin Robbins is the reference to its 31 flavours. So these were the few examples of how subliminal marketing works. However, few percentage of population might have reservations for such marketing. And for the business minds who can appreciate the genius hard work that goes behind creating such brilliant subliminal messages, this real-life Inception is as intriguing as Nolan’s Inception, which makes it a field to be explored and encashed further. However, there is a flip side to everything. Subliminal messaging is banned in Britain and Australia as it is considered unethical to make people believe into something that they may not want to. Conspiracy theorists even go as far as making web of stories around corporate world that they are trying to control the economy by controlling people’s choices and desires for products, services, etc. and for even whom to vote. Although the technology behind such marketing is praise worthy, but it is an ethical duty of the mass media industry to make more and more people aware of it, so that they at least have the right to consciously choose the products and services at the end of the day. This article has been authored by Shishira Saini from Delhi School of Economics. How To Write And Execute A Media Plan? Promotion and Advertising: Is It Always true?